Houston will see continued warm weather—with highs in the low- to mid-90s—and scattered showers during the next couple of days, but our principal focus remains on the likely redevelopment of Tropical Storm Harvey, and its eventual movement toward Texas. Parts of the state will be be utterly soaked by the end of this weekend, and some flooding seems inevitable. 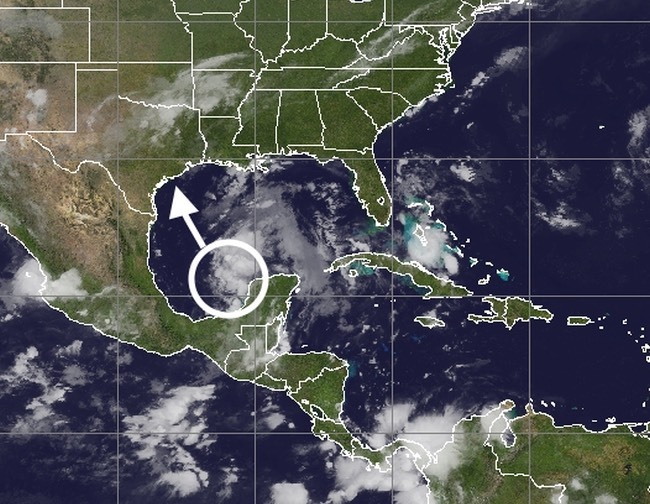 As of 6:30am Wednesday, a reconnaissance aircraft is flying around the large area of disturbed weather in the southern Gulf of Mexico, and may find a tropical depression. Some dry air appears to be slowing development right now, but the Gulf is warm and wind shear manageable, so some intensification is likely as the system moves northwest toward Texas during the next couple of days. While we cannot rule out rapid intensification, a phenomenon which is still relatively poorly understood, it is probable that Harvey will come ashore as a tropical storm or Category 1 hurricane. A landfall between Corpus Christi and Matagorda seems most likely at this time. While we may see some storm surges of 3 to 5 feet with such a storm, and tropical storm-force winds, rainfall is by far the biggest concern. On Tuesday, we talked about the poor steering currents for Harvey, which will probably cause the storm to stall after it moves into Texas, and that forecast remains the same. By Friday, or so, a high pressure system over the southwestern United States will build into west Texas. Essentially, then, this should halt the northwestward movement of the tropical system, perhaps around the Victoria area. At that point we would have a situation where a low pressure system is just inland, and able to draw lots of moisture from the Gulf of Mexico into the upper Texas coastal area. Without sounding alarmist, we should say that this is a nearly perfect scenario for continuous heavy rainfall and flooding. That does not mean it will happen, but at this point it seems likely. Large areas will likely see 5 to 15 inches of rainfall, and smaller areas may see in excess of 20 inches. There is the potential for a major rainfall event from late Friday through Tuesday in Texas. For Houston, the heaviest rains would not probably begin before Saturday. We do not know how much Harvey will intensify, but there are no indications it will become a strong hurricane right now. The forecast remains uncertain because Harvey has yet to form a well defined center of circulation, and its motion is likely to stall this weekend. While we know nothing definitive, residents should be prepared for flooding conditions this weekend and into next week. We will update as warranted. Excellent reporting once again. No need to be alarmed, but let’s be aware and be prepared. Thank you as always for being the voice of reason. I appreciate your hard work and this blog so very much! We appreciate the informative, no-hype forecasts. Thanks for your efforts, I suspect you’ll be busy the next few days. Perhaps not so much Saturday, but i’d be a bit more concerned about Tuesday. My parents are flying in Thursday evening and flying out Sunday…will flying out Sunday be a problem? Potentially, but I’d say a bit better than 50-50 right now they make it out reasonably on time. A little confused, if the storm hits Fri/Sat shouldn’t Sat be the most rainfall and have the most effect on flying. I understand the high pressure steering it but shouldn’t Sat be worse than Tues? See the new post in which I try to explain this. Really appreciate your good work!! More current, relevant information seems to be being posted here than anywhere else online. Thank you, and please keep this standard up as long as you can. The “Continuous Live Team Coverage” has begun, so we can all feel safe. I’m sure mobile units will deploy Friday morning, if not sooner, keeping us safer. Seriously, our private weather service has about the same forecast, though maybe a little southward – landfall as an 85 MPH hurricane just north of Corpus. They are a little more aggressive on rainfall, with parts of Brazoria and Galveston counties due for 20+ inches from the 24th through 29th. The gradient is very tight on their rainfall map though. The 20+ inch areas are not far from 10-14″ areas. Stay tuned and keep your galoshes nearby. Any information on whether we’ll see the extreme hourly accumulations from this storm, in the amounts that we did during Memorial Day 2015 and Tax Day 2016? Obviously we’re looking at a lot of water over a 3-4 day period, and for those in high hazard flood zones and along bayous/creeks, that is going to be something to monitor. What really seemed to cause even larger issues in the other mentioned storms has been the rapid accumulations over the period of a few hours, and it would seem (based upon current precipitation predictions) that we might avoid that. Heres hoping that if thats the case, areas less typically prone to flooding, and therefore less prepared to handle, will be spared for the most part. To echo what Jared said I’ll ask: Given that we are at or near drought conditions shouldn’t we be able to handle this system for a while, particularly if hourly accumulation rates are not extreme? I know, too soon to tell. Yes, we should be able to handle 5-10 inches over a day or two. But 15-20 inches over 2-3 days would cause significant, widespread flooding, and that cannot be ruled out. Thanks. Certainly not trying to downplay the overall concerns with that amount of rain and how it will affect flood prone areas and the bayous, but I’m just hopeful (and curious if it is even possible to predict) that we’ll be able to avoid the 1-2 hour deluge rains that really wreaked havoc across the region in the past. Have plans for my kids birthday on Saturday in West Houston near hwy 6 and West Road. Should we cancel or will we be ok. It is for early afternoon. I appreciate your honesty and thorough explanations of the weather. Tentatively, I’d say it’s OK (assuming an indoor venue). Let’s wait another day or two to make a final decision, however. From what I am seeing and what it seems to be you are saying, is Brazoria County and the Alvin area in for some heavy rain? We appreciate your forecast and how you explain it in layman terms. Thank you. That is certainly among the areas likely to be hit. 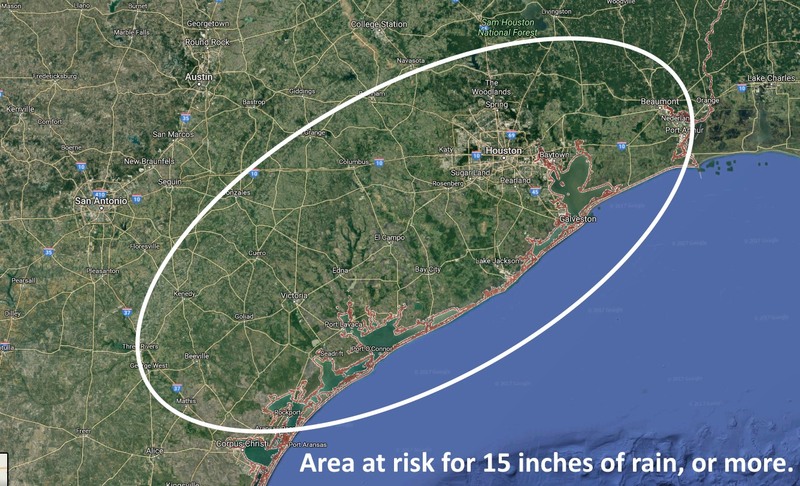 But right now we just can’t say what areas of southeast Texas will get hit hardest. I don’t know what I would do without Space City Weather. Always a trusted source for weather information and a must read every day. Even more so during uncertain times like these. Thank you Eric and Matt for everything you do. 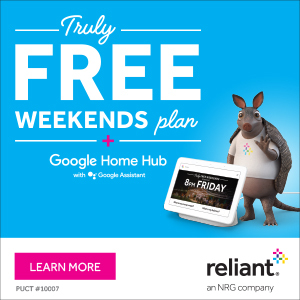 My daughters party is Saturday 10AM-12pm in West Houston – do you think guests will have a hard time coming with flooding then? Already planning on it indoors but wondering if I need to cancel? Tentatively I think you’re OK.
Eric, are we looking at a possible Allison-like event? Oh, and thank you for NOT getting people all worked up like those people on TV. We are not ruling that out, but at this time I don’t think it will get that bad. Great job as usual. I follow two sites during hurricane season, this one, and the National Hurricane Center. We are supposed to be flying back from Colorado on late Sunday afternoon. What are the likelihoods of any delays/cancellations at Hobby? Sunday is looking pretty iffy. Can’t say anything definitive now, sorry. I’m flying in to Hobby at 9 PM on Friday and out at 6 PM on Sunday – do you have an idea of how flights will be impacted by the storm/how long the rain will last over the weekend? Probably too early to tell, but I’m wondering if I should start exploring the possibility of moving my flights. I think the Friday flight will be OK, but I would have some definite concerns about Sunday. As you say, it’s just too early to say anything definitive. I appreciate the straight up, no-hype coverage. I live right next to JSC in Nassau Bay in the lowest-lying apartment in the entire complex, so I’ve already stocked up on sandbags in case we see quick downpours like Halloween 2015 or the Memorial Day floods. Hoping it doesn’t get too bad, but we don’t historically flood down here. Keeping my fingers crossed that everyone is safe. Been freaking myself out since yesterday. “Thanks Chris. As you can see, I’m standing here on the seawall in Galveston, wearing my station-logo rain slicker, while there’s bright sun and people playing behind me. I’m not saying that you should panic, but you should definitely panic and keep watching our continuous storm team coverage for the next several days. Especially the very expensive commercials that we’ll insert. We’ll do all we can to help you to panic, like these people we saw shopping at a local store. As you can see, at least one person bought a bottle of water while we watched, and we think many, many more will panic and buy all the water from the store as soon as we can arrange it. You should panic now, and avoid the rush. I can also tell you that we saw at least one car stopped at a light on the feeder as we drove here to Galveston, and so if you’re in Galveston or the Galveston area, you should consider evacuating now so we can report on more heavy traffic. Excellent!!!! You’ve gotta love the TV weathermen!!! One of the few fond memories I have from Ike was seeing Geraldo nearly inundated by a wave breaking over the Galveston Seawall. What was that idiot thinking??? I have to say I am very appreciative of your hype-free, concise weather info. My click traffic at a certain website went down materially after you launched this blog. Thanks again – keep it up. Thanks for finding me over here, John. Thanks for the great forecast. I fly out of HOU to Tulsa on Friday at 3:35 PM. Based on some other comments, it sounds like I should be fine. Would it be better to try to re-book that for late Thursday night? I think you’ll be OK. But if the storm turns toward Houston, then probably not. Won’t Corpus Christi be the worst place to be now in terms of Hurricane-force winds? We live in Brazoria County and our land typically holds water even if there’s only 2-3 inches of rain (clay-like ground and poor drainage). Last year, we managed to make it through a heavy downpour but several days later we took about 4-5 feet of water on our land from the Brazos River when it overflowed due to the amount of water coming from north of us. What is the likelihood of the river flooding again in this event? If we dodge one bullet, will we be hit by the other? We run a canine rescue organization so we’re watching the weather closely but evacuation isn’t really an option. 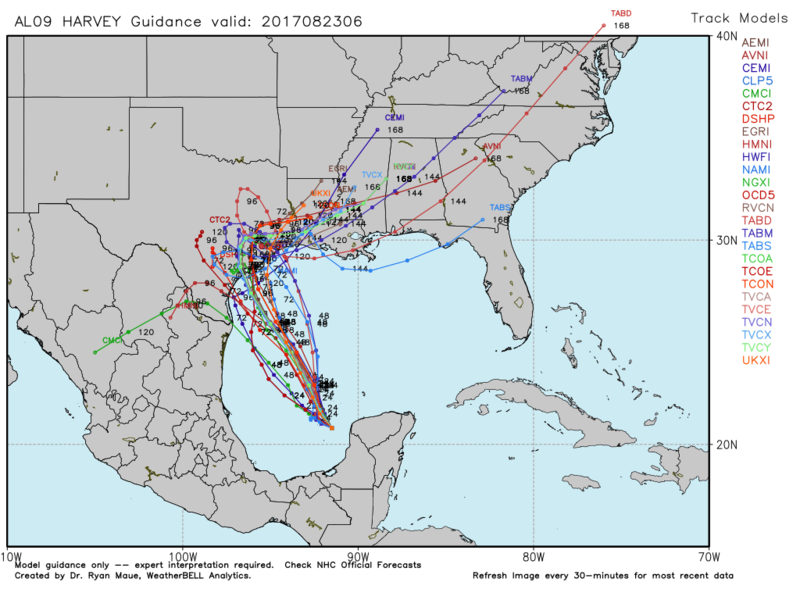 It seems the majority of the major models bend this more toward Mexico now after landfall than bend this toward the southeast or northeast. THis includes the gfs. Bastardi now hints Mexico may be “the way out” Is the emcwf model more likely to be accurate? What do you now think?